I saw this photo on the page on Facebook and had to share it with you, because I think it’s brilliant. It comes from a fourth-grade classroom in California. In the left column are phrases I often hear from my students…and I have been known to say more than a few of them myself. In the right column is a list of simple shifts in thinking that are actually quite profound. We believe what we tell ourselves, and that’s why these lists are so powerful; one small shift in the way we think about ourselves can change us profoundly. Just imagine if, every time you felt like you were not good at something, instead you asked, “What am I missing that might make this seem so difficult?” Or if you changed from being ashamed about making a mistake to understanding that mistakes are the best way we learn? This has huge potential for students who often feel like a particular subject is too hard. Often, it is that the way they were taught does not make sense for their brains, or they need to take more time and effort to try to understand it. Even students with learning differences and disabilities can use this as a way to overcome obstacles they face. It is called growth mindset, and I think it is one of the most important tools we can use as educators and parents to help kids (and ourselves) stop self-defeating behavior. Pay attention to the words you are saying to yourself and the words your child is saying. 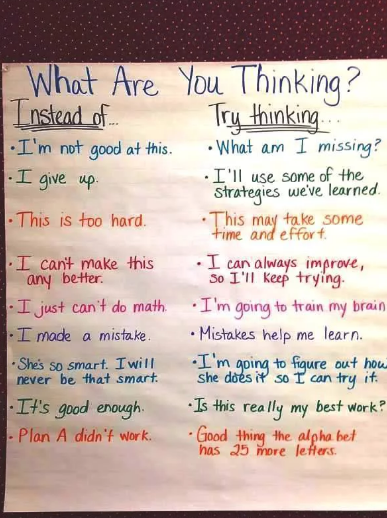 If you notice any of the phrases on the left, try changing them to the ones on the right or to other helpful phrases that shift your thinking into a more positive space.